Invisible attendees are users who can attend live sessions without showing up in the attendees list. Log into your Electa Live admin account. Only admins can set up invisible attendees. Click on Student Management (or Management in case you would like to apply the invisible option to a teacher). Click on Student Profiles (or Teacher Profiles)Find the user that you want to make invisible in the list. Click the red Options button and click Accessibility Options. Select the Invisible Attendee option and click Apply. Invisible attendees have view only options while in a live session. Invisible attendees cannot interact with the rest of the class. They can only listen and watch the live session. Live chat and all other controls are disabled for invisible attendees. While invisible attendees do not show in the attendees list and in recorded session they show in the classroom session logs just as regular users. User profile visibility does not affect the access permissions of the respective user. The visibility only affects if the user can be seen in the live session. Triggering the invisibility on/off does not remove or grant access or attendance permissions to users. Whatever access the user has as a visible user the same access remains if the user becomes invisible. 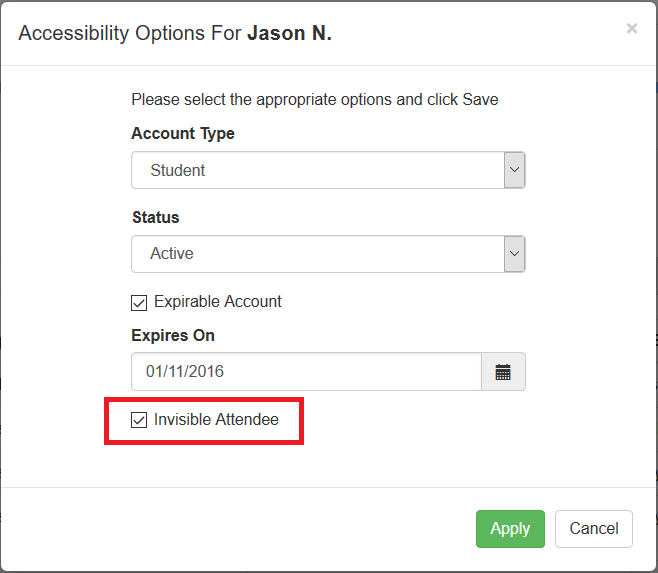 In other words - visibility is not related to attendance and access permissions. Whatever a user is allowed to do when visible remains when invisible. For example - a visible administrator remains with the same access permissions when set to invisible. Respectively - a visible teacher or a student profile remain with the same access settings as when visible.